With a length of 1,776 kilometer, the Lanzhou-Xinjiang High-Speed Railway is routed from Lanzhou to Urumqi, the capital city of Xinjiang Uyghur Autonomous Region. From December, 2014, you could explore the ancient wonders on the Silk Road with a bullet train journey, which will also feast your eyes on the grand desert scenery en route. Pay a visit to the Bingling Temple Grottoes, which can be reached after a 75 km drive from Lanzhou by car and then by boat. The grottoes are cut on steep cliffs along the Yellow River, about 2 km long in a honeycomb pattern. There are now nearly 800 sculptures in stone, clay and clay-covered stone and 900 square meters of murals preserved in 183 cases. The Waterwheel Garden is a highlight along the Yellow River in Lanzhou. The unique waterwheels will provide you an insight into the irrigation tools of ancient China. 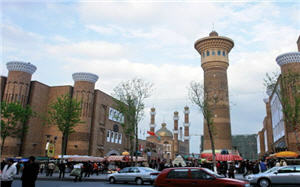 The Jiayuguan Pass, the western end of the Great Wall, is known as the most strategic point along the ancient Silk Road. Take a visit to the First Beacon Tower of the Great Wall. The beacon tower was an important part of the defense system in Jiayuguan Pass. The Mogao Grottoes (UNESCO) is one of the world's most important sites of ancient Buddhist Culture. The treasure house contains hundreds of sandstone caves holding more than 2,000 statues and 45,000 brilliantly bright paintings of Buddha and Chinese mythological figures. The Crescent Moon Lake & Singing Sand Dunes are famous attractions in Dunhuang. From a distance make sure to listen carefully for the whistling tunes among the sand dunes. If you are feeling adventurous, take an optional camel ride (on your own expense). Travel route Raiders: “Silk Road Exploration on Bullet Train”introduces you to Lanzhou Travel guides, Lanzhou holiday guide and customized personalized service for your Lanzhou travel routes as well as Lanzhou vacation packages. There are real Lanzhou tourist route evaluation, travel Q&As. If you would like to book tickets and hotels, to find China travel agencies / China tour companies for your travel to China.